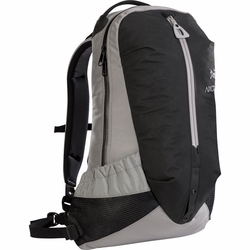 ARC'TERYX Arro 22 Backpack. Urban commuter backpack with WaterTight construction. Advanced materials and distinctive design make the larger Arro both sleek and functional. Panel loading WaterTight zipper, stretch hydration pocket, and a tough Armourlite kangaroo pocket add an escapist aspect to this metro pack.